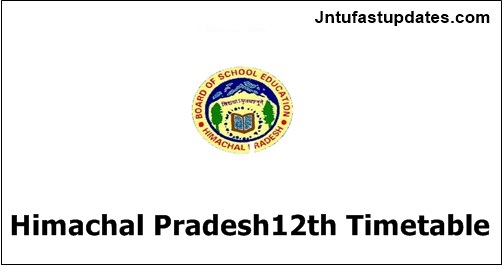 HP Board 12th Date Sheet 2019: The Himachal Pradesh (HP) Board has released the Plus Two (12th class) examination date sheet March 2019. As per the schedule examinations will be commencing from 6th March to 29th march, 2019. Students can easily check and get the date sheet through official website, www.hpbose.org. It is an agency of Government of Himachal Pradesh state entrusted with the responsibilities of prescribing courses of instructions and text books and conducting examinations for secondary school students in Himachal Pradesh. HP board take state level examination for the 10th and 12th standard in the month of March. HPBOSE will declare Result in the month of April, students can check their result from official website. As every year students are awaited for the exams to score for the good marks as they initial career begins with the Intermediate examinations. They are several government jobs which is related with the Intermediate examination results. last year also many of them secured best results . Many of them choose the higher studies and the remaining are interested in jobs. Get start prepared from today itself to get the best results. Aspirants who are studying 12th class can download the timetable 2109 PDF as prescribed in step by step process. Himachal Pradesh board has released the dates of the Annual and practical examinations March, 2019. So, it is advised to the students of class 12th to look into the dates of examinations. The Annual exams are going to start from 6th March and will end on 29th March, 2019 and Practical Exams will be held from 15th February 15 to 1st March, 2019. Official Plus Two Date Sheet will be announced soon at hpbose.org website. 1. The Question Papers in the subjects of 1.English 2.Mathematics 3.Hindi 4.Economics 5.Political Science 6.History 7.Physics 8. Chemistry 9. Biology 10.Accountancy 11.Business Studies 12.Sanskrit will be supplied in three series viz. (A) (B) (C). The candidates appearing in these subjects are directed to write the Question Paper Series given in the question paper on the title page of answer book in prescribed circle in Block Letter with ink ball point pen. 2. The candidate must write the same Question Number while attempting the question in the answer book as given in the Question Paper. 3. Question Papers and Answer Book will be distributed 15 minutes before the commencement of examination to facilitate the candidates to go through the question paper and write the particulars of the candidate on OMR Base Answer Books. The examination will be started at 9.00 AM for Regular and SOS will be 2:00 PM. Go to the official website:”http://www.hpbose.org. Click on Date Sheet link under Examinations Section. Download the Plus Two Date Sheet 2019. The Education Board prescribes syllabus, courses of instructions and text books for school education in Himachal Pradesh besides conducting examinations based on courses listed. At present, the Board conducts examination for the following classes and courses: 10th, 10+2, J.B.T and T.T.C. As many as 5 Lakh candidates annually appear in the examination conducted by the Board. Presently more than 8000 schools are affiliated with the Board. The Himachal Pradesh Board of School Education, Dharamshala came into existence in 1969 as per Himachal Pradesh Act No. 14 of 1968 with its head-quarter at Shimla later shifted to Dharamshala in January 1983. The Board started with a staff of 34 officials which has subsequently increased to 643.. The Board has set up 1846 Examination centres throughout the state. Board also publishes text books for class 1st to 12th. Apart from a Liaison Office at Shimla, the Board has also established 26 Book Distribution & Guidance/Information Centres in the state to cater to the needs of students.